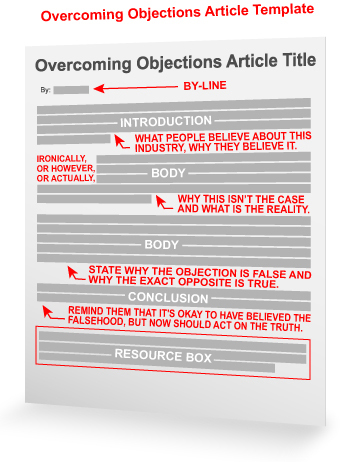 How do you demystify your reader’s objections and uncover the real truth in your niche? With so much information out there, it is easy to be lured down the wrong informational path. Even the savviest Internet readers have been led astray all too often. If you are seeing confusion within your niche, why not address it head on? As an expert in your niche, you are in a position to share your expertise and help people overcome obstacles to reach the real truth. Your shared knowledge will leverage your credibility and bring targeted traffic back to your site. 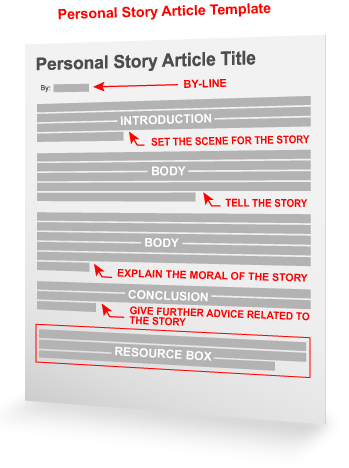 In this article template, your ability to paint a picture of a topic accurately and then cut through the objections to deliver a slice of reality builds momentum for the reader, as well as trust! Can’t think of an objection? You can gather this information by checking out discussion pages, forums, FAQs, or even collaborating with other experts. A personal story or anecdote can be the perfect gateway to the hearts and minds of your audience. Not only does a personal story give you a chance to share your experiences, but you also get to build trust with your audience by showing what you know about your niche. After all, if you’ve gone through something yourself, even if it was just one time, you probably have an insight to share with other people who face similar circumstances. The key to writing an article based on a personal story is to tell it clearly and explain the moral of the story (i.e. what did you learn from it?). Without that, there’s no point in telling the story at all. How do you address complex concepts that require industry-specific language in your articles? … write under the assumption that your target audience knows the meaning of all the niche jargon you’re using? … try to avoid complex ideas and, instead, target the general reader with little industry knowledge? … give brief definitions to explain words or concepts that may be new to some, but not all? There’s no “right” answer to this question all the time. Each article should be crafted toward the people you want to reach with that specific message (a.k.a. your primary target audience). Let’s face it, because there are people out there with every range of knowledge you can imagine, it’s not easy to please everybody and make them feel like you’re speaking directly to them. But, if you have an appropriate mix of beginner, intermediate and advanced articles, you will be able to reach a wide range of people through your entire article inventory. Maybe you have some uncommon way of dealing with an everyday problem, or you’ve developed a faster or cheaper way of doing something. Either way, you know something most other people don’t know. In fact, as an expert in your niche, you probably have quite a few secrets, but you may not think of them like that. Strangely, in the case of article writing, the “secrets” you share are the ones that define you the most. Your secrets are the unique concepts and facts that you have about your niche. You share some of your best secrets every once in a while in articles. Of course, you save some of those secrets to be shared elsewhere, but article writing is a great avenue to share your expertise. 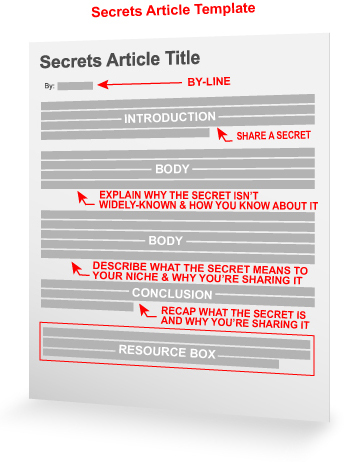 This article template is a great way to share those secrets in a succinct, guided way. Traditions are an essential part of any common culture. Long-lasting traditions from some cultures span generations. Perhaps others are shorter lived, but either way there is value to staying connected with the past through rituals, traditions and events. Whether you’re celebrating a holiday with traditional activities or cooking a traditional dish from your country of origin, the traditions that exist in your niche can make a great new set of articles for your account. 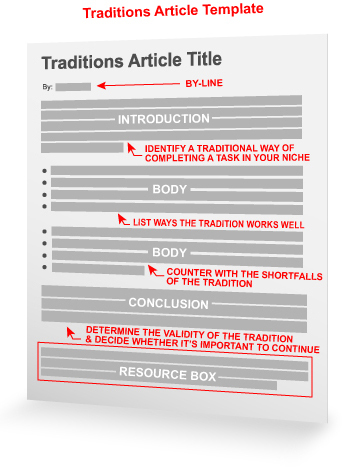 First, identify a tradition that’s been adopted in your article niche. Whatever tradition you choose should have some personal or cultural significance with which you can identify. That connection will ensure your familiarity with the tradition and why it’s important to you and others in your niche. 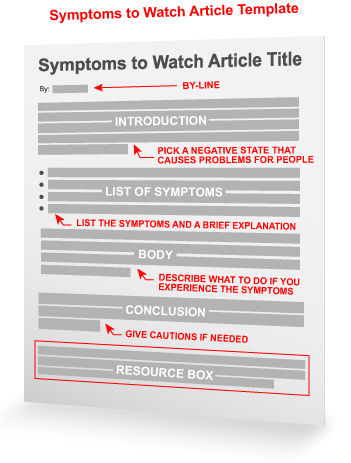 Even if your field of expertise is outside the health and wellness niche, writing a “symptoms” article could be just the thing to cure your article inspiration ills. When most people hear the word “symptoms,” they think of changes in your body that come from an illness. That’s true, but “symptoms” can also be indicators of underlying problems in any area of life – and that’s the definition we’re going to use here to help you write some great articles. For example, articles explaining the “symptoms of a shaky investment strategy” and the “symptoms of an off-balance golf stroke” would both tackle the symptoms (or indicators) of a problem. Then the articles would give the reader advice for how to deal with those symptoms and their underlying cause(s). DEAR EZINEARTICLES: How do I cope with my current problem – lack of article ideas? I saw the warning signs for a couple of months leading up to this problem and I’ve asked people around me for advice, but nothing has worked so far. I kept using up ideas and had no great way to refill my ideas folder as I went along. This is more devastating than any case of writer’s block I’ve ever experienced. Please advise me. DEAR WWAAI: I know you’re hurting, and I’m sorry about that. Everything is great when your article ideas folder is full, but as it empties, you need to continue generating new ideas. 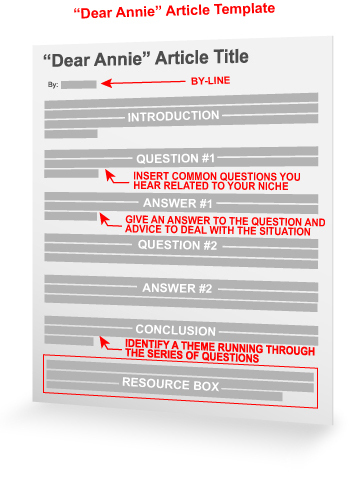 Well, one of the best solutions to deal with a lack of article ideas is to start your writing with an article template, and more specifically this “Dear Annie” Article Template. Whether you want it to or not, history will repeat itself. The best way to take control of that is by studying history and evaluating how events influence us individually and communally. On a small scale, our personal histories help us make decisions. On a larger scale, we can use the experiences of others to our advantage. 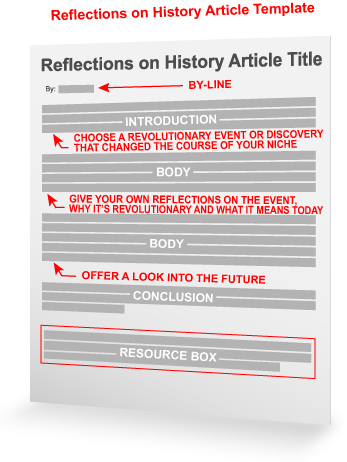 In this template, you’ll capitalize on the importance of history by writing an article based on this very topic. To start with, think of an event that shaped your niche (or the way you think about your niche) in a revolutionary way. This could be a personal event or a very public one (e.g. your first day at a new job or the day Jackie Robinson broke the color barrier in baseball). Then, use your personal knowledge and/or research to generate your own reflection on why it’s important. 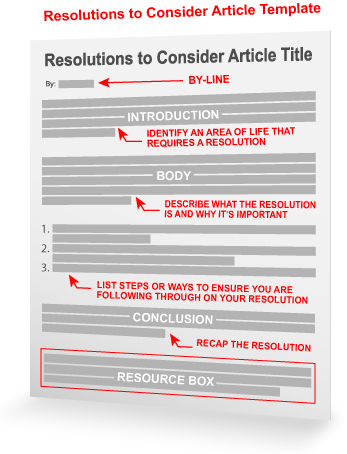 It’s the perfect time of the year to pick up this article template. Millions of people each year make New Year’s resolutions to themselves, their family and peers. Typically, these resolutions are undertaken to make lifestyle changes, reform bad habits and start a journey towards self-improvement. As this year comes to a close, it’s the perfect time to share your own ideas for resolutions to consider by writing new, high-quality articles. … or any other resolution you’ve come up with. Think of your niche and the advice you can give to people on how to establish, work through and execute their own resolutions. Then, use that advice to write and submit your own well-timed “Resolutions to Consider” article. Definition: Saving – The act of protecting something from loss or danger. Usually a resource like time, energy, money, etc. Life requires a constant balancing act of a variety of resources. Consider, for instance, three important resources: time, energy and money. In order to save one type of resource, we usually have to give up another in its place (e.g. devoting time to finding deals on consumer goods, spending money on a lawn-care service to save you the energy of doing yardwork, etc.). 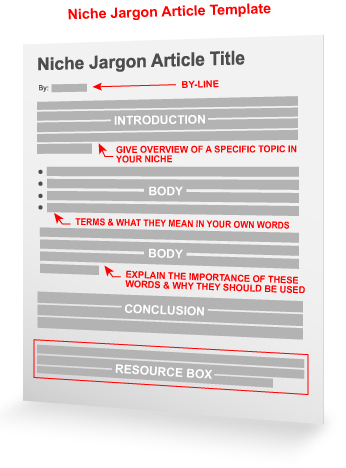 Well, today we wanted to give you this article template to save you the time and energy it takes to generate a new article idea. 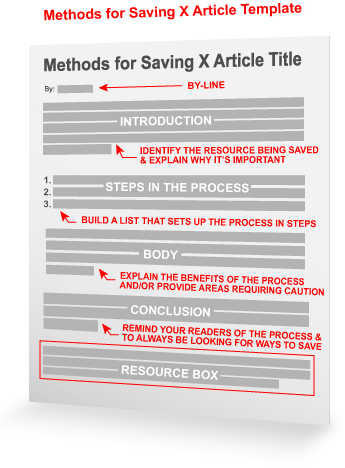 The template will help you focus on sharing your own saving techniques with your readers.